Madoff: Where Did His Money Go? What Happened To Madoff’s Money? Almost since the news broke that Bernard Madoff had confessed to running a “$50 billion Ponzi scheme”, one of the key unanswered questions has been, what happened to all that money? The short answer is, we don’t know yet. “It is still too early to say with any certainty what was going on inside Madoff’s business,” said Stephen Harbeck — who heads the SIPC, which is serving as the receiver for Madoff’s now-defunct brokerage firm — at a press conference outside U.S. bankruptcy court last week. It’s worth noting at the outset that the $50 billion figure, which came from the SEC complaint quoting Madoff’s own confession, may be inflated. The Associated Press has calculated that investors cumulatively have said they have lost $30 billion. That’s not exactly pocket change. And despite Madoff’s lavish lifestyle, it would be virtually impossible for him to have blown through that amount, or even a significant fraction of it, on his own or his family’s personal expenses. Madoff has promised to give an accounting of all his assets by the end of the year. But until the legions of forensic accountants with the FBI, the SEC, and other investigative bodies complete their enormous task of independently tracing the funds, we’ll likely remain largely in the dark. Still, piecing together various reports, several possible answers are beginning to emerge, which, taken together, may go some way to explaining the mystery. NEW YORK — Even Uncle Sam may get burned by Bernard Madoff. Investors who lost their fortunes in Madoff’s alleged Ponzi scheme will end up paying far less in taxes and may even be eligible for refunds, according to accounting experts. In addition, investors may be counting on a federally mandated insurance fund to bail them out, but that program lacks the money to pay for all the claims that are likely to come. The timing couldn’t be worse. Unemployment has surged, meaning fewer workers are paying payroll taxes. And housing prices have dropped, reducing property taxes. The recession so far has cost the federal government $200 billion in tax revenues for the 12 months that ended in November, according to estimates by Moody’s Economy.com. 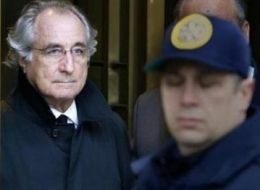 The Madoff case, which reportedly involves $50 billion, adds another layer to the fiscal crisis gripping the nation.